Looks like my trip past your place on my way to Chelan, WA. is on hold. My wife’s job and income being the concern now. I had planned on being in Stockton June 28, 2012 but may have to settle for a shorter trip to Mingus Mountain, AZ instead. Also up for pondering would have been following local protocol for your area. Not knowing if I should leave my hip flask on top of my King James bible on the night stand at home or if I would be expected to take a second wife---stuff like that. Thanks Sharon for all the information. 6 years ago I passed through salt lake city on a road trip. While flying point of the mountain, an awesome guy who's name I've forgotten introduced me to the Stockton ridge. "Hey kid, want to see my secret hang gliding spot?" I had an awesome, memorable day of flying and really loved the site. I expect to finally be coming through again in a little over a week and would like to fly the site again. Is there any protocol I need to follow? Is it on public land? Should I contact someone first? I'm welcome to just park on top of the bar? What time does the wind usually kick in by to soar the north side? Are the winds on the stockton bar usually stronger, or weaker than at point of the mountain? And how much do you need for it to be pretty brain dead soarable? Is there a good website that shows the wind speed and direction from that valley? Hello Andrew, and Welcome to the Tooele Hawks forum!!! I've had some great flights at the Stockton bar as well. It's a super place with friendly folks. It's also a great place for practicing top landings. Just don't fly back behind the bar on your approach or you may find yourself in deep sink and possibly rotor. I'm in San Diego, but I've just called one of my friends in Tooele to let them know about your post and your questions. Unfortunately, this forum doesn't get much traffic because it's been black-listed by hanggliding.org, so I took the liberty of making the phone call to give them a "head's up" about your post. So you should get some answers soon either via a post here or through a PM. So please check back. Finally, I hope you have a good time on your trip, and please post pictures whenever you can. In the past I have flown the bar many many times. It is a magical place. I have not been back in years and wanted to make sure the site is still opened to hang gliding and paragliding pilots. Welcome to the US Hawks Josh!!! The Tooele Hawks are a pretty close knit club, and they do most of their communication by just picking up the phone or meeting in person. So they don't tend to use this forum very much. Thanks for posting. I remember when that was first published, and it was a very nice article. I called Jerry and spoke to Sharon, and she said that Greg is the person to check with. So I called Greg and left a message with his Sharon, and I'll try back again tonight. I'm sorry that this is taking so long. One of Jerry's sons suffered a fairly serious paragliding accident a while back, and I think that's been pretty heartbreaking to their family. Thanks for the follow up. I am very sad to hear about the accident. I met the Tooele Hawks today. They had an impressive group on April 18 at Stockton Bar. Good bunch of guys. I met Gary, Calvin, Casey, and Reeder. 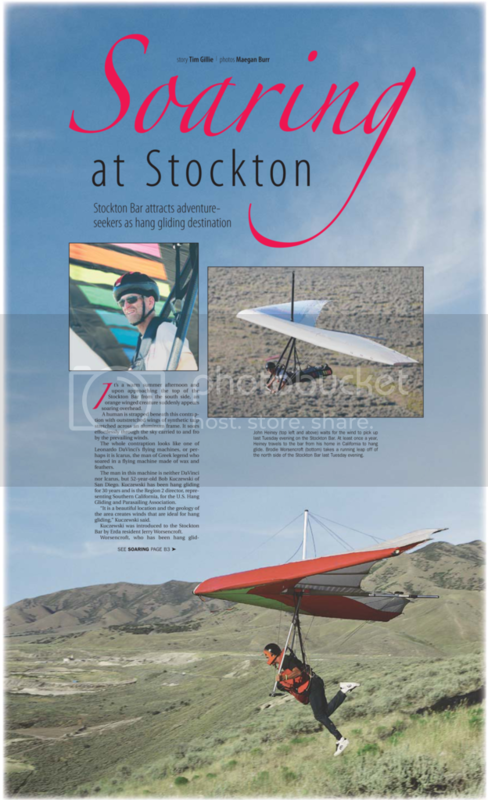 The Stockton Bar is a really cool place to fly. It's like Point of the Mountain without the crowding. I wish you the best for the rest of your trip, and please post some pictures when you can! !